Training consistently is what distinguishes champions from the rest of the crowd. 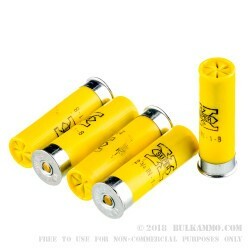 With the Winchester 20ga Super-X #8 Shotshell, you can now find your own inner champion without having to break the bank. The Winchester 20ga Super-X #8 Shotshell is one of the most well established and trusted brands in the world of clay target shooting today. 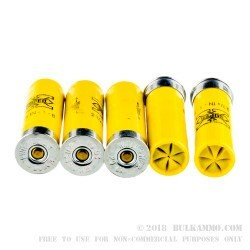 Aluminum heads offer identical chamber pressures as their brass counterparts, without all the additional costs. 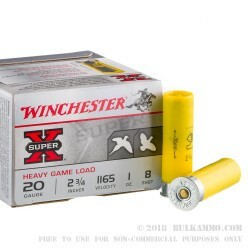 A powder charge loaded to 2-½ drams ensures the Winchester 20ga Super-X #8 Shotshell will cycle in even the most stubborn of semi-automatic shotguns, and at an average muzzle velocity over 1,200 feet per second, you can be confident in center punching clay targets out to 20 yards and beyond. 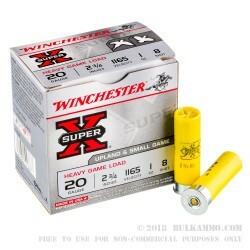 Clay target shooters in need of a high volume clay target ammunition that will allow them to finely hone their skills without breaking the bank may never choose another ammunition ever again over the Winchester 20ga Super-X #8 Shotshell.